For Product and Fitment Information Contact U. Quality Crafted Rubber Parts & Weatherstripping. Our promise to our customers is to find a solution for their restoration needs. We promise that our parts will be the highest quality available on the market. To do this, we promise to research and test every part we make for an accurate fit, great looks and long life. Made to Fit and Last. At Steele Rubber Products, weve been restoring our own cars before we made our first rubber parts so, we understand that quality craftsmanship and dependable performance are expectations. We only build parts that we would put on our own cars! Our product specialists are not just weatherstripping experts, but are also automotive enthusiasts. Like you, we love old cars and we speak your language. We promise to do everything we can to help find the proper rubber solution for your vehicle and treat your car, truck or street rod like its our own. 33-39 Buick Cadillac Chevy Olds Pontiac Post Model Side Window Run Channel Kit. Steele Rubber Part Number: 90-0140-58. This side window run channel kit is used for EITHER the front doors or for rear doors for models with vents in the doors. This kit will fit Post Models cars Only. The set includes one two (2) of #70-0347-58, channel, rigid run, window division bar, made of stainless beaded edge and is mohair-lined. It is an exact replacement for rear side of division bar. The set also includes two (2) of our #70-0555-58, belt line weatherstrip, door window inner & outer, front & rear doors. These measure 7/16" wide X 36", with chrome bead, mohair faced, flexible. This set also includes two (2) each of our # 70-1238-58, flexible window run channel, stainless beaded edge. These are cloth covered, mohair lined FLEXIBLE metal channels for sides and top of door windows, perfect dimensions, 5/8" wide X 9/16" overall height. Made from top quality rubber to ensure durability and proper seal. Please check the Matching Vehicles tab to confirm this part is applicable to your vehicle. 2dr Coupe, 4dr Trunkback Sedan. 4dr Formal Sedan - 6 Passenger, 4dr Limousine, 4dr Sedan - 6 Passenger, 4dr Sedan - 8 Passenger. 2dr Business Coupe, 2dr Rumbleseat Sport Coupe, 2dr Sedan - 5 Passenger, 4dr Sedan - 5 Passenger, 4dr Trunkback Sedan - 5 Passenger. 2dr Business Coupe, 2dr Sport Coupe, 2dr Victoria Coupe, 4dr Sedan - 5 Passenger. 2dr Sport Coupe, 2dr Victoria Coupe, 4dr Sedan - 5 Passenger. 2dr Sedan - 5 Passenger, 2dr Victoria Coupe, 4dr Limousine, 4dr Sedan - 5 Passenger, 4dr Sedan - 7 Passenger. 2dr Coupe - 2 Passenger, 2dr Coupe - 5 Passenger, 2dr Roadster, 4dr Phaeton, 4dr Sedan - 5 Passenger, 4dr Sedan - 7 Passenger, 4dr Touring - 7 Passenger. 2dr Collapsible Coupe Convertible, 2dr Coupe - 2 Passenger, 2dr Coupe - 5 Passenger, 4dr Close Coupled Sedan - 5 Passenger, 4dr Close Coupled Town Sedan - 5 Passenger, 4dr Imperial Brougham - 7 Passenger, 4dr Imperial Cabriolet - 5 Passenger, 4dr Imperial Cabriolet - 7 Passenger, 4dr Imperial Sedan - 7 Passenger, 4dr Limousine, 4dr Livery Limousine - 7 Passenger, 4dr Livery Sedan - 7 Passenger, 4dr Sedan, 4dr Sedan - 5 Passenger, 4dr Sedan - 7 Passenger, 4dr Town Cabriolet - 5 Passenger, 4dr Town Cabriolet - 7 Passenger, 4dr Town Coupe - 5 Passenger. 2dr Coupe - 2 Passenger, 2dr Coupe - 5 Passenger, 2dr Roadster, 4dr Cabriolet - 5 Passenger, 4dr Cabriolet - 7 Passenger, 4dr Phaeton, 4dr Sedan - 5 Passenger, 4dr Sedan - 7 Passenger, 4dr Touring - 7 Passenger, 4dr Town Car - 5 Passenger, 4dr Town Car - 7 Passenger. 2dr Collapsible Coupe Convertible, 2dr Coupe - 2 Passenger, 2dr Coupe - 5 Passenger, 4dr Close Coupled Town Sedan - 5 Passenger, 4dr Imperial Brougham - 7 Passenger, 4dr Imperial Cabriolet - 5 Passenger, 4dr Imperial Cabriolet - 7 Passenger, 4dr Imperial Sedan - 7 Passenger, 4dr Limousine Brougham - 7 Passenger, 4dr Livery Limousine - 7 Passenger, 4dr Sedan - 5 Passenger, 4dr Sedan - 7 Passenger, 4dr Town Cabriolet - 5 Passenger, 4dr Town Cabriolet - 7 Passenger. 2dr Convertible - 5 Passenger, 2dr Coupe, 2dr Coupe - 2 Passenger, 2dr Coupe - 5 Passenger, 2dr Roadster, 4dr Cabriolet - 5/7 Passenger, 4dr Cabriolet - 7 Passenger, 4dr Limousine - 7 Passenger, 4dr Phaeton, 4dr Sedan - 5 Passenger, 4dr Sedan - 5/7 Passenger, 4dr Sedan - 7 Passenger, 4dr Touring - 7 Passenger. 2dr Fleetwood Town Coupe - 5 Passenger, 2dr Town Coupe - 2 Passenger, 2dr Town Coupe - 5 Passenger, 4dr Imperial Sedan - 7 Passenger, 4dr Sedan - 5 Passenger, 4dr Sedan - 7 Passenger, 4dr Town Sedan - 5 Passenger. 2dr Coupe - 2 Passenger, 4dr Sedan - 5 Passenger. 2dr Coupe - 2 Passenger, 2dr Touring Sedan - 5 Passenger, 4dr Sedan - 5 Passenger, 4dr Touring Sedan - 5 Passenger. 2dr Coupe - 2 Passenger. 2dr Coupe - 2 Passenger, 4dr Touring Sedan - 5 Passenger. 4dr Touring Sedan - 5 Passenger. 4dr Commercial Imperial Sedan - 7 Passenger, 4dr Commercial Imperial Touring Sedan - 7 Passenger, 4dr Commercial Sedan - 7 Passenger, 4dr Commercial Touring Sedan - 7 Passenger, 4dr Formal Sedan - 5 Passenger, 4dr Imperial Sedan - 7 Passenger, 4dr Imperial Touring Sedan - 7 Passenger, 4dr Sedan - 5 Passenger, 4dr Sedan - 7 Passenger, 4dr Touring Sedan - 5 Passenger, 4dr Touring Sedan - 7 Passenger, 4dr Town Sedan - 7 Passenger. 4dr Commercial Imperial Sedan - 7 Passenger, 4dr Commercial Imperial Touring Sedan - 7 Passenger, 4dr Commercial Sedan - 7 Passenger, 4dr Commercial Touring Sedan - 7 Passenger, 4dr Formal Sedan - 5 Passenger, 4dr Imperial Sedan - 7 Passenger, 4dr Imperial Touring Sedan - 7 Passenger, 4dr Sedan - 5 Passenger, 4dr Sedan - 7 Passenger, 4dr Touring Sedan - 5 Passenger, 4dr Town Sedan - 7 Passenger. 2dr Coupe - 2 Passenger, 2dr Coupe - 5 Passenger, 4dr Close Coupled Town Sedan - 5 Passenger, 4dr Imperial Cabriolet - 5 Passenger, 4dr Imperial Sedan - 7 Passenger, 4dr Sedan - 5 Passenger, 4dr Sedan - 7 Passenger, 4dr Town Cabriolet - 7 Passenger. 2dr Business Coupe, 2dr Coach - 5 Passenger, 2dr Coupe - 4 Passenger, 2dr Sedan - 5 Passenger, 4dr Sedan - 5 Passenger. 2dr Coach - 5 Passenger, 2dr Coupe - 2 Passenger, 2dr Coupe - 4 Passenger, 2dr Sedan - 5 Passenger, 4dr Sedan - 5 Passenger. 2dr Coach - 5 Passenger, 2dr Coupe - 2 Passenger, 4dr Sedan - 5 Passenger. 2dr Coach - 5 Passenger, 2dr Coupe - 2 Passenger, 2dr Coupe - 4 Passenger. 2dr Coupe, 2dr Coupe - 5 Passenger, 4dr Sedan - 5 Passenger. 2dr Business Coupe, 2dr Club Sedan - 4 Passenger, 2dr Sedan - 5 Passenger, 4dr Sedan - 5 Passenger. 2dr Business Coupe, 2dr Coupe - 4 Passenger, 2dr Sedan - 5 Passenger, 4dr Sedan - 5 Passenger, 4dr Touring Sedan - 5 Passenger. 2dr Business Coupe, 2dr Coupe - 5 Passenger, 2dr Touring Sedan - 5 Passenger, 4dr Touring Sedan - 5 Passenger. 2dr Business Coupe, 2dr Coupe, 2dr Sedan - 5 Passenger, 4dr Sedan - 5 Passenger. 2dr Coupe, 2dr Sedan - 5 Passenger, 4dr Sedan - 5 Passenger, 4dr Trunkback Sedan - 5 Passenger. 2dr Business Coupe, 2dr Coupe - 4 Passenger, 2dr Sedan - 5 Passenger, 4dr Sedan - 5 Passenger. 2dr Business Coupe, 2dr Rumbleseat Coupe, 2dr Slantback Sedan - 5 Passenger, 2dr Touring Sedan - 5 Passenger, 4dr Slantback Sedan - 5 Passenger, 4dr Touring Sedan - 5 Passenger, 4dr Wagon - 3 seat. 2dr Business Coupe, 2dr Rumbleseat Coupe, 2dr Slantback Sedan - 5 Passenger, 2dr Touring Sedan - 5 Passenger, 4dr Slantback Sedan - 5 Passenger, 4dr Touring Sedan - 5 Passenger. 2dr Business Coupe, 2dr Coupe - 5 Passenger, 2dr Touring Sedan - 5 Passenger, 4dr Touring Sedan - 5 Passenger, 4dr Wagon - 3 seat. 2dr Business Coupe, 2dr Sedan - 5 Passenger, 4dr Sedan - 5 Passenger. We encourage you to pre-fit parts before installing. Please note, if you alter or damage a part in any way, we may not be able to accept it for return. These charges are not imposed by us and are not under our control. They will not be part of your order total. We cannot estimate these charges. You are responsible for paying these charges. 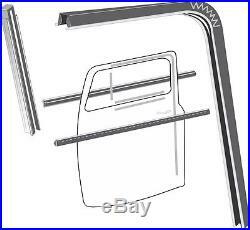 The item "33-39 Buick Cadillac Chevy Olds Pontiac Post Model Side Window Run Channel Kit" is in sale since Thursday, June 14, 2012. This item is in the category "eBay Motors\Parts & Accessories\Vintage Car & Truck Parts\Other Parts". The seller is "steelerubber" and is located in Denver, NC. This item can be shipped to United States.